A mother-of-two injured in a car crash involving the Duke of Edinburgh has said she has received a message from the Queen - but is "surprised" Prince Philip has not tried to contact her personally. Emma Fairweather said a member of the Queen’s staff left a voice message after trying to ring her to find out how she was following the incident which left her with a broken wrist. The 46-year-old said it was "confusing" to receive a message "from someone else’s partner who wasn’t involved in the accident". "The door is absolutely still open for him to reach out," she told the Daily Mirror. "While it’s nice the Queen has seen it may be appropriate to ask one of her staff to contact me and wish me well, she wasn’t involved in the accident. "I’m still quite surprised that Prince Philip hasn’t felt he wants to contact me and inquire as to how I am." It emerged on Sunday that Ms Fairweather had not been contacted by anyone from the palace following the crash, which happened on Thursday afternoon, despite officials saying the parties involved had exchanged "well-wishes" with Philip. Following the comments, a source told ITV News that senior members of the royal household attempted to contact the driver and passenger involved in Thursday’s crash to deliver good wishes from the Queen and Duke of Edinburgh. They attempted to make contact over the weekend but have so far been unsuccessful. A police liaison officer also made contact with the driver and passenger on Friday to deliver a message and good wishes were returned. Philip, 97, escaped the crash without injury, although the women involved in the crash required hospital treatment for their injuries. The baby escaped unhurt. Ms Fairweather said she has been advised by doctors she may need surgery on her wrist if attempts to set the break fail. Philip reportedly said "I’m such a fool" as he was pulled from the wrecked car by Roy Warne. 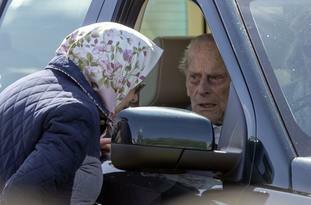 The 75-year-old told The Sun he heard Philip telling police he had been "dazzled by the sun". But he added: "If the sun was so low and right in your eyes, sometimes it’s impossible to see, and that may well have been the case, and that would afford him a defence."